Docracy has collected the experience of many designers to provide a wide range of starting points for less experienced creative professionals, and to start a permanent free legal resource for the community. You will find a collection of some pretty useful legal documents there. You can have a look at this Collective Legal Guide For Designers. 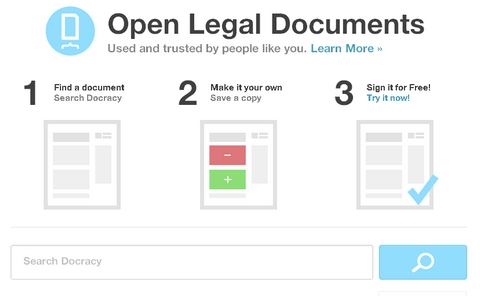 Docracy is a social repository of contracts, legal agreements and other legal documents. Their mission is to make these documents freely available to the public. They also hope to make them easier to find, customize and execute. No more shady templates behind a paywall that you download hoping everything will be alright. Instead: reputable, transparent sources and social proof to help you find something as close as possible to the perfect document. Not only they are free to download, but also free to customize, store and sign online. The goal is to create a library of industry standard documents which will help you save on legal fees and transaction costs, hosted by a reliable third source. Every design project is different and the best will result from trust between the client and the designer. The most effective way to assure trust meets both client and designer expectations in an engagement is to codify the relationship with a written agreement. 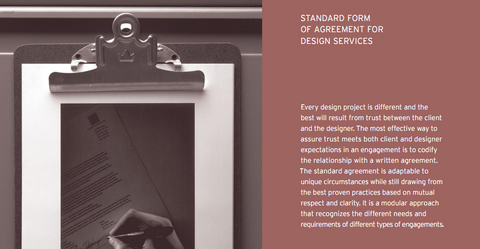 AIGA has shared Standard Form of Agreement for Design Services with us. The standard agreement is adaptable to unique circumstances while still drawing from the best proven practices based on mutual respect and clarity. It is a modular approach that recognizes the different needs and requirements of different types of engagements. If you’re a freelance graphic designer and do not have contracts or standard terms and conditions that you provide your clients to sign prior to starting a project. You will at some point need it to protect your business. We have mentioned “Freelance Design Contracts for Web Designers” few days ago. Now TheDesignCubicle has published an article of “What to Include In Your Design Contracts“, which listed the basics and essentials to include in your standard graphic design terms and conditions or contracts. 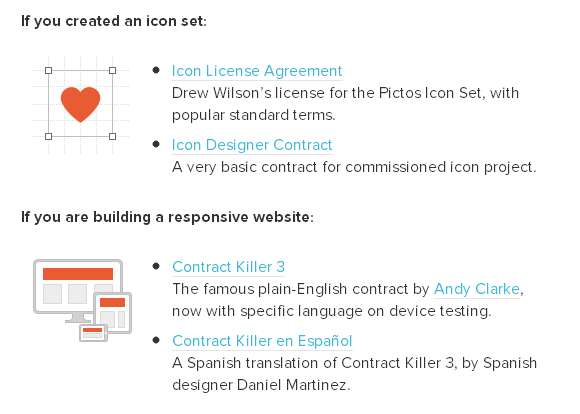 You may find it useful on building your own design contracts as well. However, the guidelines are only a starting point and should be included in every design contract. They should be adapted over time, modified as needed and specific to each designer. Using the right forms and freelance design contracts is critical for today’s designers, whether you are a freelancer or work in a firm. There are some useful Freelance Design Contracts and Templates provided by Jason Vaughn of CreativePublic. You can find SEO Submission Form, Sales Rep. Contract, Art Approval Sheet, Invoice, Creative Strategy, Print Questionnaire, Terms and Conditions and more. You can customize and add your own logo on those templates. You will need Adobe Illustrator to alter or change the current forms. If you don’t have Adobe Illustrator, you can use Macromedia Freehand to customize these files to fit your needs. For those that do not have Adobe Illustrator, PDF files have been created for printing and viewing. However, you will not be able to alter the look and feel. 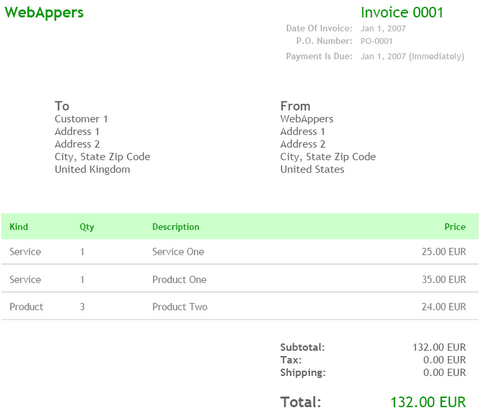 Invoice Machine is a free web 2.0 application that let’s you create free and beautiful PDF invoices in a snap. Click on “Start The Invoice Machine” to begin creating your custom invoice. Do not need to worry about the security and privacy issue, because they claimed that they do not store any information of your created invoices. Simply fill in the forms, your nice-looking invoice will be ready in a minute. Download the PDF invoices and send it over to your client so you get your money in a professional way. docstoc is a user generated community where you can find and share professional documents. Find a vast quantity of high quality legal, business, technology, educational, and creative documents for free. docstoc allows users to upload their documents for all the world to share. In addition, users can store their documents in their own personal online folders for anytime, anywhere access. Similar to the service of Free Legal Documents by Website-law, Designers Toolbox provides us a set of legal documents templates. So that we can save a lot of money for that and invest more money on development. Different from Website-law, link and credit of each document are not required. However, we need to register as a member in order to download the documents which are in .doc format. Notes: I am sorry that the legal documents are no longer available on the site. You may look at the following legal documents templates instead.